It was the right time to year for Neil to collect the honey from his strongest hive. 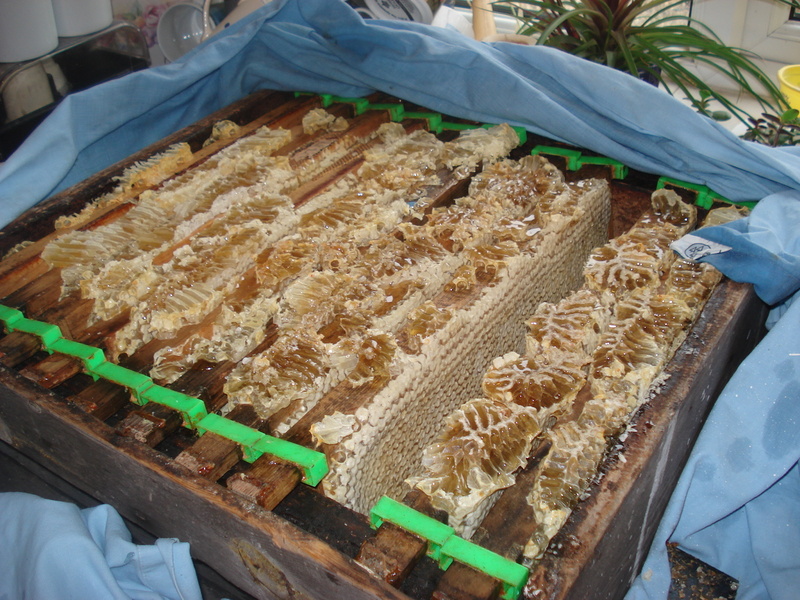 He had put 3 supers on to give them plenty of room to store the honey. But when he looked they had only filled the frames in 2 supers. He donned his new all-in-one suit to collect the frames. Yesterday we set to spinning the frames. First he uncapped them one by one. Then two at a time he put them in the spinner. 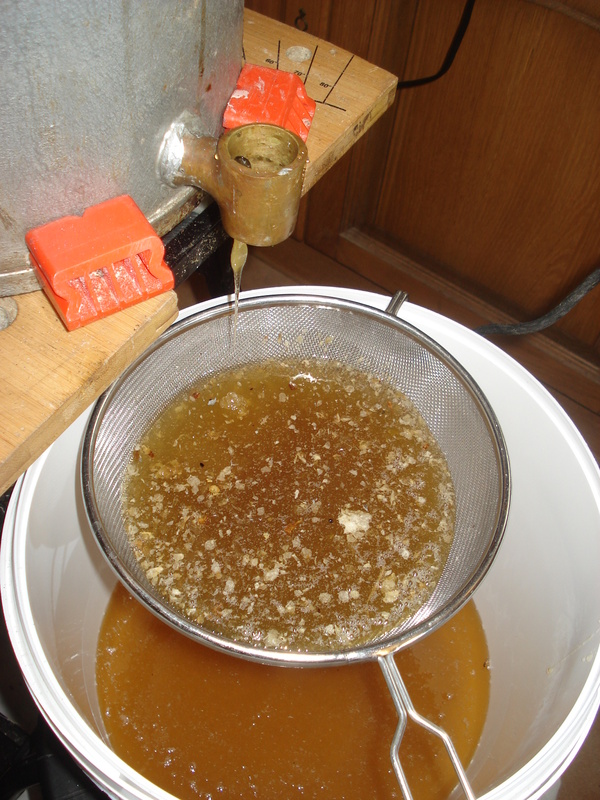 Centrifugal force pushes the honey out and it is collected in large jar below, first going through a sieve to collect any wax. It’s wonderful to see the golden liquid collecting in the jar. Then it has to be poured into jars and weighed to get exactly one pound in weight that is 454g. That was my job. We got quite a haul. The jars are just waiting for their labels to be printed and then we will be ready to sell some. It will be £6.00 a jar. Don’t forget this is an expensive premium product, not mass produced, hence the cost. All proceeds go back into care of the bees. Neil is a swarm contact for the Taunton Beekeepers and last week he took a phone call from a lady in Wambrook near Chard, who said she had a hive of bees she wanted to get rid of. They had belonged to her Father in Law and he had become indisposed and was no longer able to care for them. They were near the house and her daughter was afraid to go into the garden because of them. So Neil duly went over to investigate and what he found was a strong hive of bees and a super full of frames of honey. It was really heavy so he brought back the super first and then went back for the brood box and then put the hive back together down by our woods. Next he put an excluder on so the bees could vacate the honey rich super but not get back in. Then in the evening he went down to remove the honey heavy frames and bring them up to the house. 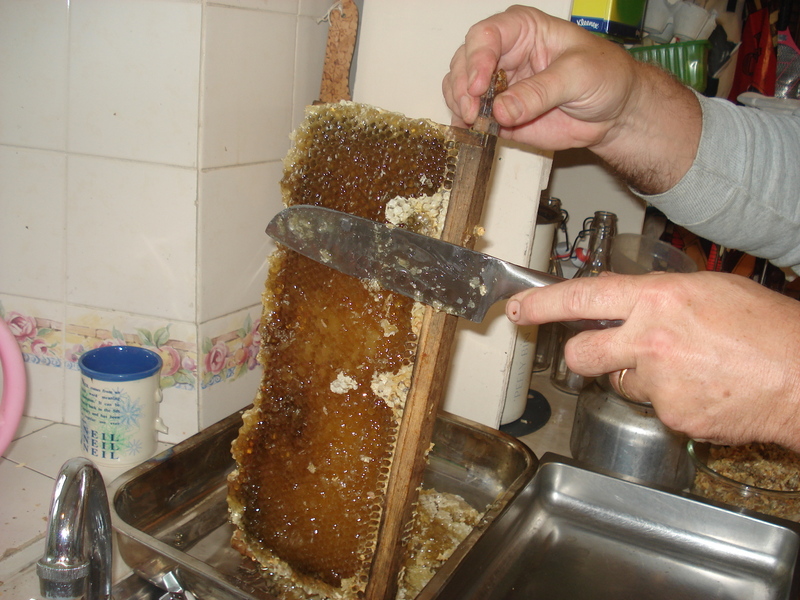 Yesterday we extracted the honey from the frames. First Neil uncapped the frames. Then we put 2 frames at a time into the honey spinner, where centrifugal force means the honey is flung out of the frames into the spinner. Neil put a drill on the handle to get it to spin faster than if we turned it by hand. 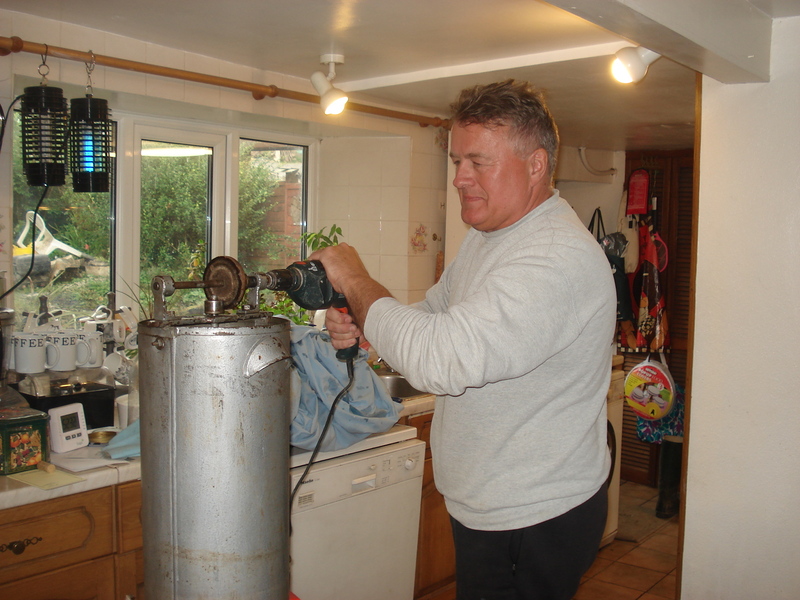 We then opened the tap at the bottom and let the honey flow out through a sieve to catch any wax and into a honey bucket. Of course we got a bit sticky in the process and had to keep licking our fingers!!! Mmmm – delicious. 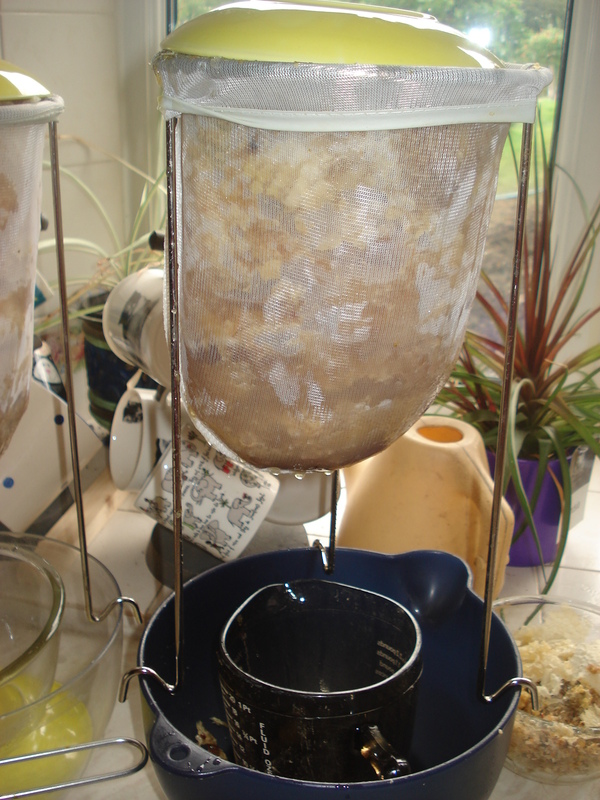 The cappings we put into a strainer bag and let the honey from them drip through. 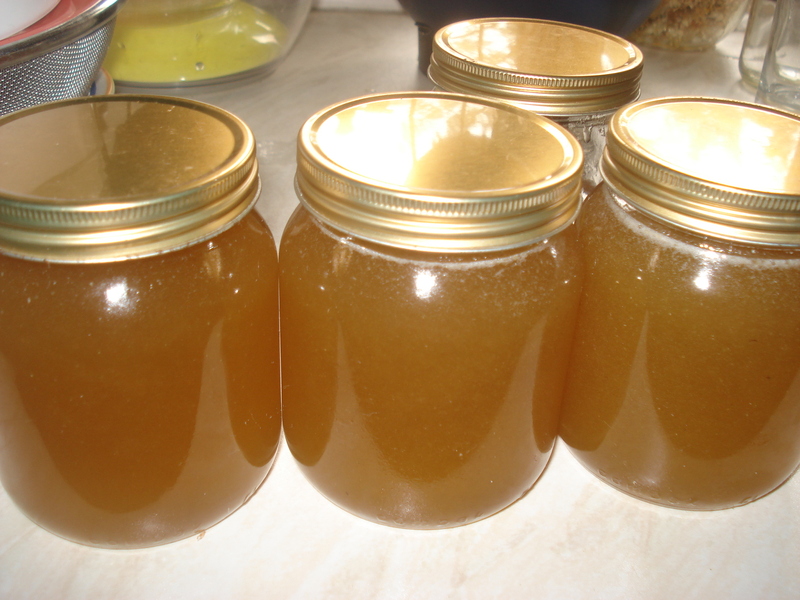 The last job was to pour the strained honey into jars. We just did a few today, and gave a jar each to our 2 neighbours and one to a friend. We shall take a jar to the lady who gave us the bees. I’m not sure we will have loads of it but it is gorgeous and viscous and quite dark and of course to us it was free!